Buy a Bottle of Tanqueray and You’ll Get Two #FREE Copa Glasses! Spend £31 and Get #FREE DELIVERY! Get 2 X #FREE Glasses with Every Bottle of Rhubarb Gin! 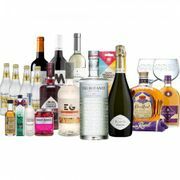 Get a FREE Balloon G&T Glass with This Selection of Warner Edwards Gin. Buy Any Bottle of Baileys & Get a FREE Chocolate Reindeer! Enjoy FishersGin with 2 X FREE Gin Mugs. Every Purchase of Slingsby Rhubarb Gin, Recieve a FREE Copa Glass! £5 off GhostVodka and Get a Free Ghost T-Shirt with Every Bottle!